About two weeks ago, I had the privilege and pure luck of attending a “Breakfast with Jeff Pulver” in Jerusalem. What is it? It’s a networking event (note: no actual breakfast, just coffee) similar in feel to speed dating. Every attendee gets a “toolkit” with a name badge, tiny rectangular stickers for tagging (you can fit about one or two words on them), a pen, and some postage stamp sized post-it notes. On your name badge, you are supposed to write a tagline, and this is your introduction to people when you meet them. After no more than 5 minutes of conversation, you are to “tag” their body with the tiny stickers, and move on. If you’re naturally reserved, the name taglines break the ice. Additionally, once you’ve been “tagged,” those tags offer more discussion topics. I was struck by how seamlessly we incorporated social media tools (tagging, blog bylines, favorites) into our real life meeting. I was also struck by the utility of these tools in “real time,” if also the total geekiness I felt using them! But let me say, I loved it. I met the people behind intriguing websites (The Big Felafel, Israel Innovation, Green Any Site) and others that offer interesting collaborative possibilities. I left there wondering what other social networking tools or habits we can use that can bring us together in real time and pondering the implications for the non-profit sector. 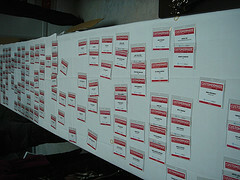 What about gathering donors/foundations/funders and non-profits together in a room with some small blank “tags,” asking them to network with real-time tagging? After a while, people could form tag clusters which might open up interesting collaborative possibilities and funders could easily identify target markets. What if we found people whose blogs or sites we want to link to and put “real time links” on them? Wouldn’t that open up interesting possibilities for NGOs and others? The local organic farming association might link to an environmental cause, a website developer, a PPC guru and the export representative from the local government. What if we mapped out a social network influence chart at the meetup? Everyone would group or “link” to others that already link to in our on or offline networks. Looking at the influencers and links might offer more social media networking possibilities after the meetup. Would we find out more about our donors, members or collaborators that could help non-profits to do their work more effectively? By the way, can you guess my tagline? “Good questions lead to profitable answers.” What’s yours? Great post Debra – I’d like to continue the conversation offline (as well as online!). My tagline was “Pluralism is my middle name”. Thanks, Joel for your comments and videos. I was happy that you posted the video of participants introducing themselves– it helped to refresh my memory of who I met that day. I also think it gives readers a good idea of what happens at a Jeff Pulver breakfast.